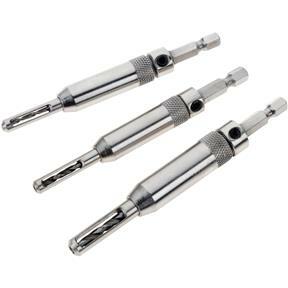 Hinge Bit Set, 3 pc. Milescraft 23170003 - Hinge Bit Set, 3 pc. Pre-drill perfectly centered holes for proper alignment of your hinges and more. Spring-loaded drill bits are self-centering and have a 1/4" shank that fits all drills. Set includes: 5/64" for #3 and #4 screws; 7/64" for #5 and #6 screws; and 9/64" for #8 and #10 screws.